Widescreen HR Recording. viewfinder displays widescreen image in a letterbox view. 2.7 inch LCD screen. switch from standard 4:3 to 16:9 Widescreen HR at the touch of your finger. Image Stabilization helps you shoot great professional-looking video by correcting camcorder shake instantly. Exclusive DIGIC DV signal processing circuit. Smooth Zoom Control. Level Shot Control levels the horizon for perfect video footage of a breathtaking landscape or keep your child in the center of the frame while they're on the soccer field. Auto Exposure Mode. Exposure Lock. Auto Slow Shutter Function. Image Sensor: 1/6 inch CCD . 680000 pixels. Tape Format: Video cassettes bearing the DV mark. Maximum Recording Time (with an 80-min. cassette): SP: 80 min. LP: 120 min. Lens: f/2.6-65mm f/1.8-2.6 25x power zoom. Widescreen HR Recording. Stunning Digital Photography. viewfinder displays widescreen image in a letterbox view. 2.7 inch LCD screen. switch from standard 4:3 to 16:9 Widescreen HR at the touch of your finger. 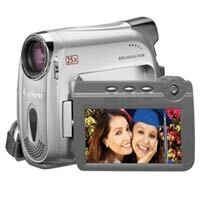 Image Stabilization helps you shoot great professional-looking video by correcting camcorder shake instantly. Exclusive DIGIC DV signal processing circuit. Smooth Zoom Control. Level Shot Control levels the horizon for perfect video footage of a breathtaking landscape or keep your child in the center of the frame while they're on the soccer field. Auto Intelligent Auto Focus ensures sharp images and gives creative flexibility. Canon's Progressive Photo feature gives you sharper detail in your digital photography. Scene Modes - select from: EASY P Portrait Sports Night Snow Beach Sunset Spotlight or Fireworks. Three different image settings are available depending on your subject: Vivid Neutral and Skin Detail. Auto Slow Shutter Function. Motion JPEG Mode you can also record movie clips directly to your camcorder's memory card for posting online or e-mailing to family and friends. Analog Line-In/Converter - feed the analog signal from your TVand it will convert the signal to digital for recording on DV tape. Image Sensor: 1/6 inch CCD . 680000 pixels. Tape Format: Video cassettes bearing the DV mark. Maximum Recording Time (with an 80-min. cassette): SP: 80 min. LP: 120 min. Lens: f/2.6-65mm f/1.8-2.6 25x power zoom. Widescreen HR Recording. 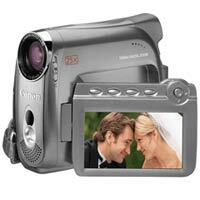 2.7 inch viewfinder displays widescreen image in a letterbox view. switch from standard 4:3 to 16:9 Widescreen HR at the touch of your finger. The ZR700's powerful 25x optical zoom lens. 1000x digital zoom. Image Stabilization helps shoot great professional-looking video by correcting camcorder shake instantly. exclusive DIGIC DV signal processing circuit. Smooth Zoom Control. Level Shot Control levels the horizon for perfect video footage. Built-in Video Light allows you to keep shooting in low-light conditions. Stunning Digital Photography. 9 Point Auto Intelligent Auto Focus ensures sharp images and gives creative flexibility. Progressive Photo feature gives you sharper detail in your digital photography. Scene Modes - EASY P Portrait Sports Night Snow Beach Sunset Spotlight or Fireworks. Image Effects - Vivid Neutral and Skin Detail. Simultaneous Photo Recording - Capture great still images while you shoot video. Perfect Exposures. Exposure Lock. Auto Slow Shutter Function. Motion JPEG Mode - record movie clips directly to your camcorder's memory card for posting online or e-mailing to family and friends. Analog Line-In/Converter - feed the analog signal from your TV VCR or analog camcorder to your ZR700 and it will convert the signal to digital for recording on DV tape. SD MultiMediaCard For portable storage versatility. 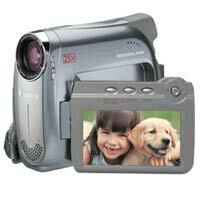 accommodates either a Secure Digital (SD) Memory Card or a MultiMediaCard. Image Sensor: 1/6 inch CCD . 680000 pixels. Tape Format: Video cassettes bearing the DV mark. Maximum Recording Time (with an 80-min. cassette): SP: 80 min. LP: 120 min. Lens: f/2.6-65mm f/1.8-2.6 25x power zoom.